More than 1,500 Scientologists gathered in Hollywood October 10 to celebrate the inauguration of the Golden Crest—a second new religious retreat opened in as many weeks to keep pace with the Church’s unparalleled expansion. The Golden Crest religious retreat opened Saturday, October 10, to provide ideal accommodations to Scientologists arriving in Los Angeles for Scientology services. 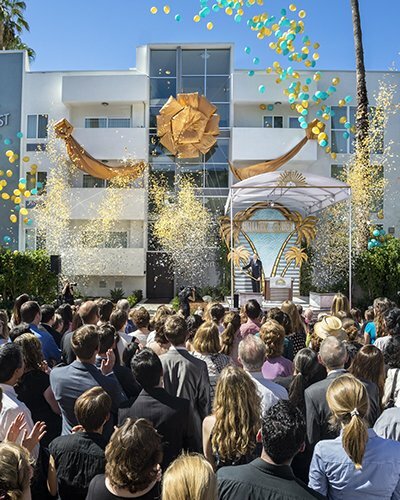 More than 1,500 Scientologists cheered as the ribbon fell, signaling the grand opening of the Golden Crest religious retreat. Yet another step in the nonstop expansion of the Scientology religion, the Golden Crest opened in Hollywood October 10. Once the ribbon was cut and the doors opened, attendees streamed into the Golden Crest, eager to see the new accommodations. The Golden Crest welcomes Scientologists arriving for Scientology Services from across the Americas. Bright and spacious, the Golden Crest offers the comfort and convenience parishioners need while in Los Angeles for Scientology training and auditing. Each apartment is perfectly configured for parishioners to audit themselves to the state of Clear and OT. The Golden Crest was created with one thing in mind—to provide the ideal environment for those traveling to Los Angeles for Scientology auditing and training. With all the comforts of home, the Golden Crest is perfect for families and those in L.A. for extended stays. Guests may also enjoy the California sunshine at the Golden Crest’s central patio and swimming pool. Just minutes from the Ideal Pacifica Bridge, the Golden Crest is a home away from home for parishioners in L.A. for Scientology services. The Golden Crest opens to keep pace with this year’s unparalleled expansion, as the numbers of Scientologists arriving to Los Angeles for advanced Scientology services continues to grow. Over 1,500 gathered in Hollywood October 10 to celebrate the dedication of the Golden Crest, a second new religious retreat to serve Scientologists attending Scientology training and spiritual counseling. Just minutes from the Ideal Pacifica Bridge, the Golden Crest’s spacious apartments are convenient and distraction-free—and thus the ideal environment for parishioners to audit themselves to the state of Clear and beyond. Perfect for families and those in L.A. for extended stays, the Golden Crest is dedicated for Scientologists participating in services at the Ideal Pacifica Bridge—the complex of Churches on L. Ron Hubbard Way that spans the entire range of Scientology services. It begins with the Ideal Church of Scientology of Los Angeles at the intersection of Sunset Boulevard and L. Ron Hubbard Way—where Scientologists and those first learning about the religion progress through all the fundamental levels of the Scientology Bridge to Total Freedom. Adjoining the Church of Scientology of Los Angeles, the American Saint Hill Organization, ASHO, takes Scientologists through the next phase of their journey with legendary Power Processing. It is also here that Scientology ministers and ministers-in-training perfect their skill on the Saint Hill Special Briefing Course. With the dedication of two new religious retreats in as many weeks—the Fountain October 3 and the Golden Crest October 10—parishioners may choose the facility that best suits their needs as they ascend the Bridge on L. Ron Hubbard Way.